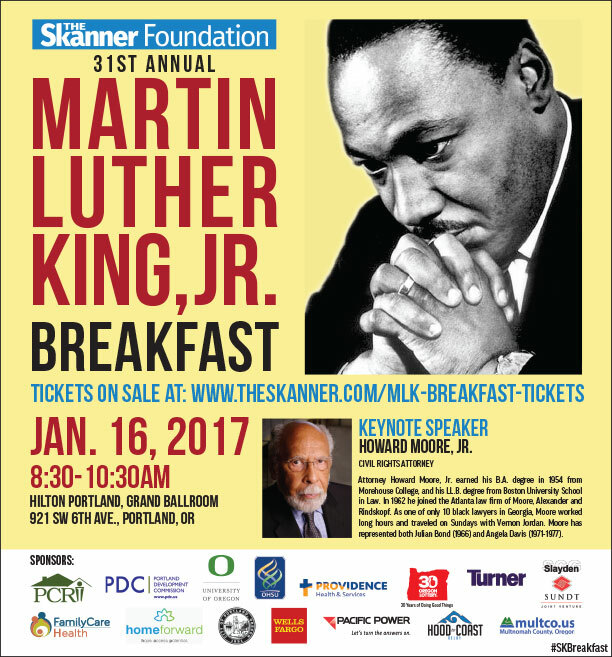 Oakland-based civil rights attorney Howard Moore, whose clients have included Angela Davis and Julian Bond, will speak at The Skanner Foundation’s 31st annual Martin Luther King, Jr. Breakfast at 8:30 a.m. Jan. 16 at the Hilton Hotel. He told The Skanner he intends to talk about the aspects of like Martin Luther King, Jr. predicted in his writings that have become relevant in recent years. For instance, he said, King wrote about the rise of automation and the threat it imposed on regular jobs. Moore noted the hollowing of the middle class has been enabled by automation, and the advent of self-driving trucks and cars could make it worse: 3.5 million people drive trucks for a living, and Uber – which already relied on a freelance drivers rather than a traditional employment contract with a guaranteed wage -- is experimenting with a fleet of self-driving cars. The future could be very grim if nothing replaces the current economic model, which is quickly being eroded, he said. “Dr. King talked about having a guaranteed annual wage. No one has discussed that in recent memory. 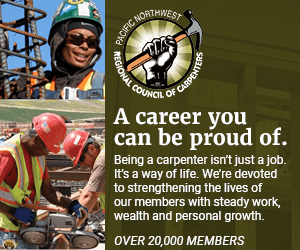 Jobs, as we know jobs, don’t exist in the way they once did,” he said. Moore was born in Atlanta in 1932, and as a young man worked as a sportswriter for the Atlanta Daily World. When he attended Morehouse College, an interest in journalism evolved into an interest in politics. He earned a bachelor’s degree in political science in 1954 and an LL.B degree (bachelor’s degree in law) from Boston University’s School of Law in 1960. Moore served as a clerk for United States District Court Judge Charles E. Wyzanski, Jr. and was admitted to practice law in Massachusetts in 1961. He returned to Atlanta in 1962, where he was one of 10 African American attorneys in the state of Georgia. He traveled with civil rights activist Vernon Jordan on Sundays. Alongside attorneys Donald Hallowell and A.T. Walden, Moore worked to promote anti-discrimination laws such as the Civil Rights Act and the Voting Rights Act, as well as two court cases – City of Greenwood v. Peacock and Georgia v. Rachel – which used federal civil action to counterattack against unconstitutional attempts to use state law against citizens exercising their rights. In 1966 Moore represented Julian Bond in his fight to take seat in the Georgia House of Representatives, and he was part of the NAACP team in the 1970 Supreme Court Decision of Turner v. Fouche. After moving to the West Coast, Moore became part of the legal team that represented Angela Davis between 1971 and 1977. Moore said traditional civil rights organizations, and the left as a whole, have lacked political imagination – failing to predict, for instance, that Hillary Clinton’s primary wins among Black voters in states where Democrats rarely win would not translate to a decisive win in the general election. And President-Elect Donald Trump has paid lip service to civil rights, but Moore said he’s skeptical, especially given Trump’s appointment of Jeff Sessions – whose record on race and immigration is damning – to the attorney general post. “Whatever commitment he has will be rhetorical only,” Moore said. But Moore said he’s encouraged by younger movements like the Black Lives Matter movement. “The most encouraging signs in terms of civil rights would be the Black Lives Matter movement, where the real energy and creativity seems to be coming from right now,” Moore said. To purchase tickets for this year’s breakfast, click here. For more information about The Skanner Foundation’s scholarships, awarded at the breakfast, please click here. For more information about The Skanner Foundation, click here.